By Antara Dasgupta in EPF, Latest News on November 29, 2017 . Universal Account Number or commonly known as UAN is a 12 digit unique number allotted to each member of Employee Provident Fund (EPF) which helps them to control their EPF account. EPFO (Employees Provident Fund Organization) have introduced the facility of UAN in 2014 in order to make EPF accounts transferrable. If you have an EPF account and making your contributions in it, you are required to have an UAN then. This facility is provided to everyone by freshers, new employees, even employees who have older EPF accounts but do not have a UAN yet. As an employee you will have to generate a UAN number and provide the number to your employer at the time of joining, when you need to fill up forms for your EPF contribution. This step has been taken by EPFO because a large number of new joiners were facing problems due to mismatch of data with Aadhaar. Therefore, an open functionality is being provided where employees can generate UAN themselves. Also note that to get a UAN, you will have to provide Aadhaar number, which means only one UAN is generated per person. Follow the below mentioned steps to know how to generate your UAN Online. 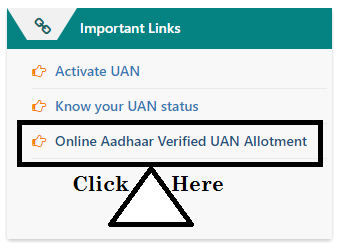 Near the bottom right of the page, click on the online Aadhaar – verified UAN allotment link. Enter your Aadhaar number on the resulting webpage. Enter the OTP (One Time Password) which you will receive on your Aadhaar registered mobile as an SMS. Once you have authenticated with OTP, the system will fetch your basic information from the Aadhaar database and auto – populate the needed information. After that click and obtain your UAN. Once you do that you will receive your UAN on your registered mobile phone as an SMS. In case of any misspelling or incorrect information in your EPF account or the information on Aadhaar does not match with details in EPF account, the EPFO will allow you to correct details such as spelling of your name, date of birth and gender and you can correct it as per your Aadhaar details. For this, visit the same link again i.e. unifiedportal-mem.epfindia.gov.in/memberinterface and under the “Manage” button, go to “Modify Basic Details” by providing your Aadhaar number. The system will get your basic details from Aadhaar and update your EPF account. And then it will be sent to the employer for the verification purpose and afterwards it will be processed by the Employee Provident Fund authority. And this process may take few days to complete. At present, these facilities are available only on the official website of EPFO and the authority is working towards launching it on the Umang App as well.